Problems with the 787 Dreamliner have dragged down Boeing's stock price. The mechanical problems continued Wednesday for Boeing's new 787 Dreamliner, an aircraft seen as a key part of the company's future. Boeing has a lot at stake: The company has delivered 49 Dreamliners so far and is cranking them out to fill some 800 additional orders. The planes, which sell for nearly $200 million apiece, have so far been delivered to several major airlines, including Japan Airlines and United Continental Airlines. United Continental last year became the first U.S. carrier to take delivery of the plane. In the third incident this week, an All Nippon Airways flight in Japan was canceled Wednesday after the crew discovered an error message related to the 787 Dreamliner's braking system. On Tuesday, a Japan Airlines 787 flight was canceled in Boston after a fuel leak was discovered as the plane was preparing for departure. And on Monday, a fire broke out on an empty Japan Airlines 787 on the ground in Boston. The fire was traced to batteries used to trigger the auxiliary power unit, which provides electricity while the plane is on the ground, according to Japan Airlines. Boeing, in a statement, said the fire on Monday did not seem to be related to other power system issues that have occurred with other Dreamliners. The National Transportation Safety Board is investigating the incident. 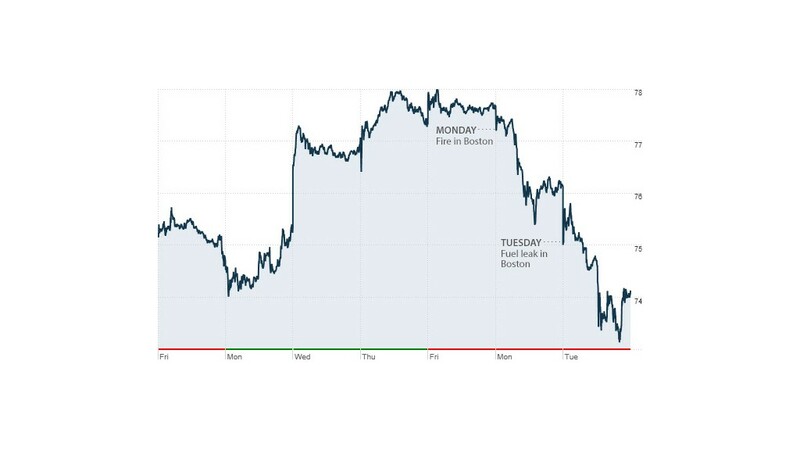 The first two incidents helped hammer Boeing (BA)'s stock price, which ended at $74.13 Tuesday, down 4.6% from the close of trading Friday. But Boeing shares recovered, trading more than 3% higher on Wednesday morning. Despite all the mechanical problems that the Dreamliner's been having, Cowen and Co. airline analyst Cai Von Rumohr said the issues appear to be unrelated and not the result of a design flaw. "What you really don't want is a sort of design problem that's common to a number of planes," Rumohr said. "That's very expensive to fix. At this point, that doesn't appear to be the issue ... not to say that having a battery explode is a good thing." Rumohr said that airlines are unlikely to cancel existing orders with Boeing, because they're other option is a six-year waiting list for new planes from Airbus. "People are not going to cancel," he said. "Airlines understand you have squawks in the beginning." Boeing's 787 Dreamliner is the first commerical jet to be made from light-weight composite material that includes carbon fibers. The Dreamliner made its debut in October 2011 with its first commercial flight, three years behind schedule. There were also three incidents last year, two of them involving engine failures during ground tests. The most recent incident happened in December, when pilots for United Airlines, a carrier owned by United Continental Holdings (UAL), managed to safely divert a Dreamliner to New Orleans after experiencing mechanical problems. The Dreamliner had experienced a mechanical problem during a test flight in 2010 from Yuma, Ariz., to Laredo, Texas. A fire caused the airplane to lose electrical power, but the pilots managed to land it safely using backup systems. The 42 people on board evacuated via emergency slides. -- James O'Toole of CNNMoney, Yoko Wakatsuki of CNN and CNN Wires staff contributed to this story.